In this intro, Richard Heinberg explains the ground covered in the short, online, Think Resilience course. It is a very affordable course and several of us in the Whangarei Transition Towns have done it. We are keen to get together with others to discuss the course material and its implications for our community. Please let me know if you are interested. Professor Guy McPherson clearly and passionately advocates an urgent response to climate change. He will soon be in New Zealand touring with his Abrupt Climate Change: and Pursuing a Life of Excellence speaking tour, in Whangarei at the In Step Dance Studio, from 1.30 to 5.00 p.m. Saturday 26 November 42, Reyburn House Lane. You can read more about Professor McPherson at his Nature Bats Last website and register for the event here. Thanks to John Clarke for organising this event. Please pass this on through your networks. A Local Food Northland conference? 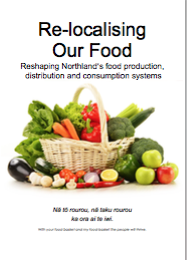 Local Food Northland is in the early stages of planning a local food conference. A big part of the shift to a more sustainable food systems is working together – so the diverse people and groups that have an interest in food and health can learn about what each other are doing and build productive connections. We are still finalising the dates and venue, but it could be as early as February 2017. We are talking with a potential keynote speaker from the U.S. who has a prominent role in promoting food policy initiatives. These are the 25 goals for Vermont’s Farm to Plate strategic plan. It makes sense to adapt this for our own purposes and part of the conference will be about shaping up some of these goals in the Northland context. A sustainable food system in Northland has to be grounded in our Treaty partnership, so we will make some room for one or two goals specifically focusing on kai Māori. Notice that many of these goals are focused on commercial food production and distribution, others are about food related aspects of social and environmental sustainability and others are about policy. Which of these goals motivate you? If you can see yourself being involved in promoting one or more specific goals, please contact us. You can leave a comment below, or contact Jeff Griggs, Clive McKegg or Peter Bruce-Iri. Have you done a MOOC yet (Massive Online Open Course)? I have completed Otto Scharmer’s u.Lab course twice now, because it was so good. It is on again in September. It is highly relevant to our aspirations for local food for at least two key concepts in the course. Otto Scharmer uses hi Theory U to illustrate how our societies and economies around the world have evolved through four stages. The first is state centric, based on hierarchy and centralised control. The next two, free market and social markets, introduced markets and competition and then moderating influences such as NGOs and unions. These three sectors continue to operate in conflict and have exhausted the extent of their value. Proponents of each suggest that more of their chosen ideology will provide the necessary remedy. Otto Scharmer points to the emergence of a new societal model – the co-creative society. It is the earlier three sectors, but rather than competing, they are working together – seeing and acting from the whole. In the local food context, we would not have monopolies dominating. The links between food production, consumption, health and a thriving local economy, that are so evident to us, will drive decision making when we get to look at things more holistically. The second very relevant concept is about our listening. Otto Scharmer guides us through the need to suspend the voices of judgement, cynicism and fear to help us get to a space when we can co-create and together “step into the future that wants to emerge”. Last year a group of Northlanders get together for weekly “coaching circles” as part of this course. If a group of us were to do the course we could create a coaching circle specifically focussing on local food. Please comment if you are interested. Here is a link to a short self-paced introductory course and to details of the full course.